, LL. D. an eminent agricultural writer, was born in 1739, at Hermiston, a village near Edinburgh. 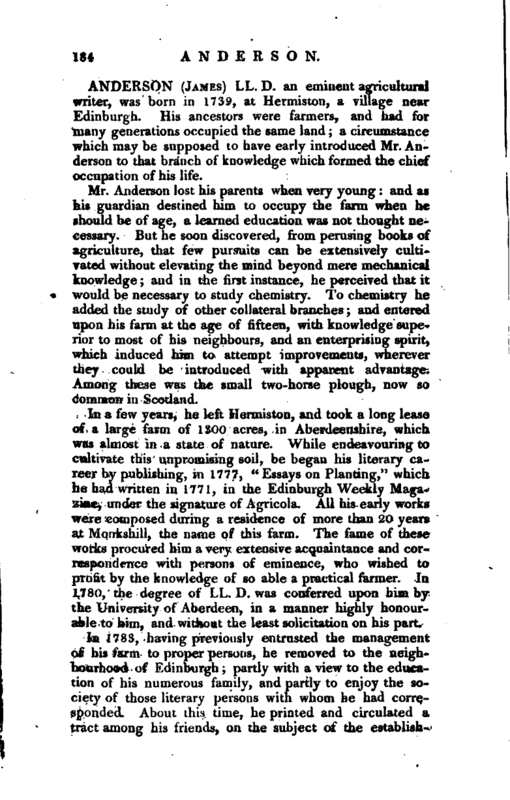 His ancestors were farmers, and had for many generations occupied the same land; a circumstance which may be supposed to have early introduced Mr Anderson to that branch of knowledge which formed the chief occupation of his life. Mr. Anderson lost his parents when very young: and as his guardian destined him to occupy the farm when he should be of age, a learned education was not thought necessary. But he soon discovered, from perusing books of agriculture, that few pursuits can be extensively cultivated without elevating the mind beyond mere mechanical knowledge; and in the first instance, he perceived that it would be necessary to study chemistry. To chemistry he added the study of other collateral branches; and entered upon his farm at the age of fifteen, with knowledge superior to most of his neighbours, and an enterprising spirit, which induced him to attempt improvements, wherever they could be introduced with apparent advantage. Among these was the small two-horse plough, now so common in Scotland. In a few years, he left Hermiston, and took a long lease of a large farm of 1300 acres, in Aberdeenshire, which was almost in a state of nature. While endeavouring to cultivate this unpromising soil, be began his literary career by publishing, in 1777, “Essays on Planting,” which he had written in 1771, in the Edinburgh Weekly Magazine, under the signature of Agricola. All his early works were composed during a residence of more than 20 years at Monkshill, the name of this farm. The fame of these works procured him a very extensive acquaintance and correspondence with persons of eminence, who wished to profit by the knowledge of so able a practical farmer. In 1780, the degree of LL/-D. was conferred upon him by the University of Aberdeen, in a manner highly honourable to him, and without the least solicitation on his part. In 1783, having previously entrusted the management of his farm to proper persons, he removed to the neighbourhood of Edinburgh; partly with a view to the education of his numerous family, and partly to enjoy the society of those literary persons with whom he had corresponded. About this time, he printed and circulated a tract among his friends, on the subject of the | establishment of the North British Fisheries, which, although not published, drew the attention of government; and he was requested by the treasury to take a survey of the western coast of Scotland, for the purpose of obtaining information on this important subject. He readily acquiesced, and performed the task in 1784. 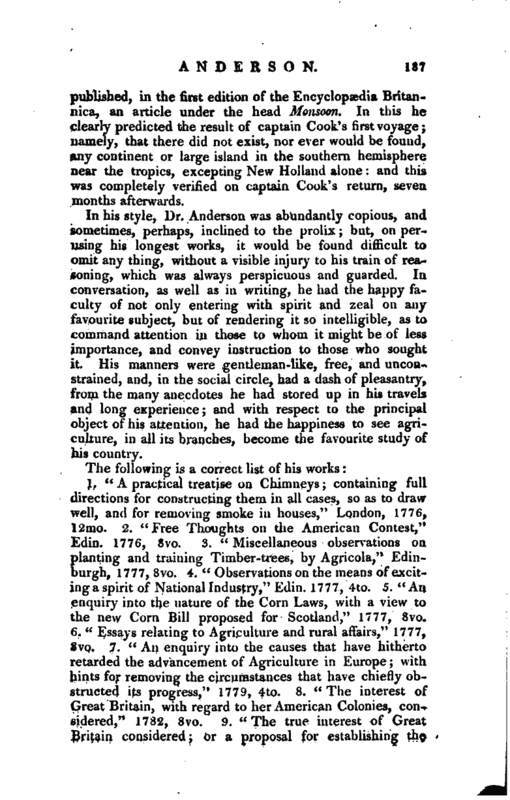 The report of the Committee appointed to inquire into the state of the British Fisheries, May 11, 1785, makes very honourable mention of Mr. Anderson’s services. After his return, he resumed his literary labours in various shapes; and, among other schemes, projected a periodical work, intituled “The Bee,” to be published weekly, and to consist of the usual materials of a Magazine. Its encouragement was for a considerable time such as to enable him to carry on this work with advantage. Agriculturists, scholars, men of taste and fancy, became occasionally his correspondents in the Bee; which, however, owing to some difficulties in the mode of publication, he was compelled to relinquish. He wrote much in this work: not only the principal part of the papers that are without signature, but numerous others signed Senex, Timothy Hairbrain, and Alcibiades. 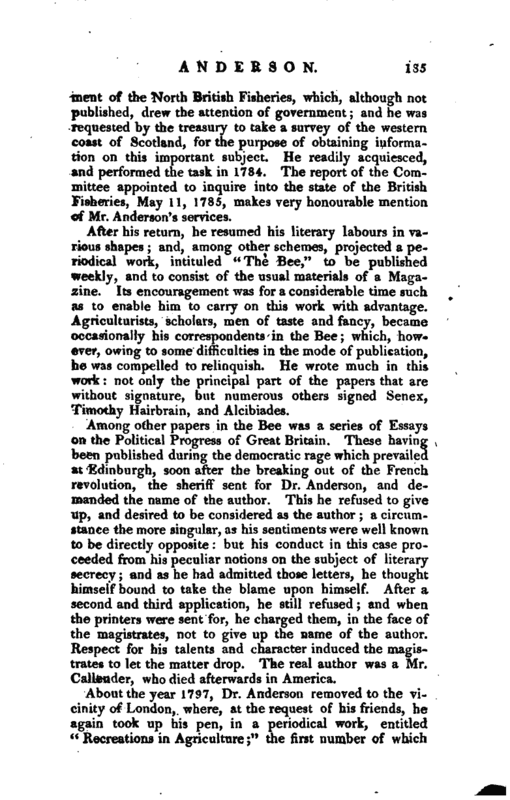 Among other papers in the Bee was a series of Essays on the Political Progress of Great Britain. These having been published during the democratic rage which prevailed at Edinburgh, soon after the breaking out of the French revolution, the sheriff sent for Dr. Anderson, and demanded the name of the author. This he refused to give up, and desired to be considered as the author; a circumstance the more singular, as his sentiments were well known to be directly opposite: but his conduct in this case proceeded from his peculiar notions on the subject of literary secrecy; and as he had admitted those letters, he thought himself bound to take the blame upon himself. After a second and third application, he still refused; and when the printers were sent for, he charged them, in the face of the magistrates, not to give up the name of the author. Respect for his talents and character induced the magistrates to let the matter drop. The real author was a Mr. Callender, who died afterwards in America. 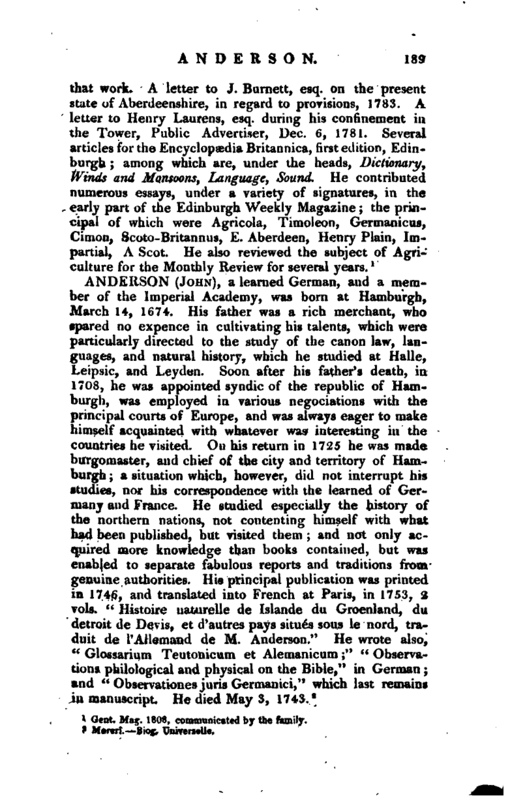 About the year 1797, Dr. Anderson removed to the vi cinity of London, where, at the request of his friends, he again took up his pen, in a periodical work, entitled “Recreations in Agriculture;” the first number of which | appeared in April 1799. The greatest part of this work was composed by himself, except what was enriched by correspondence from abroad, and a very few contributions from his friends at home. The same difficulties, however, occurring as in the, case of his “Bee,” with respect to the mode of publication, he pursued this work no longer than the sixth volume, March 1802. From this time, except in the publication of his correspondence with general Washington, and a pamphlet on Scarcity, he devoted himself almost entirely to the relaxation of a quiet life, and particularly the cultivation of his garden, which was now become the miniature of all his past Jabours. For some time before his death, his health and powers suffered a very sensible decline. He died Oct. 15, 1808, aged 69. He was twice married. First, in 1768, to Miss Seton of Mounie, an amiable and accomplished woman, by whom he had 13 children. She died in 1788. 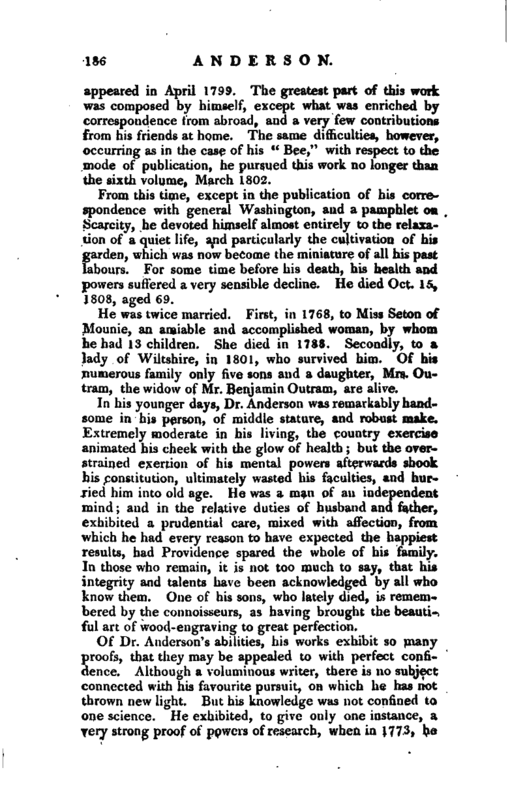 Secondly, to a 4ady of Wiltshire, in 1801, who survived him. Of his numerous family only five sons and a daughter, Mrs. Outram, the widow of Mr. Benjamin Outram, are alive. In his younger days, Dr. Anderson was remarkably handsome in his person, of middle stature, and robust make. Extremely moderate in his living, the country exercise animated his cheek with the glow of health; but the overstrained exertion of his mental powers afterwards shook his constitution, ultimately wasted his faculties, and hurried him into old age. He was a man of an independent mind; and in the relative duties of husband and father, exhibited a prudential care, mixed with affection, from which he had every reason to have expected the happiest results, had Providence spared the whole of his family. In those who remain, it is not too much to say, that his integrity and talents have been acknowledged by all who know them. One of his sons, who lately died, is remembered by the connoisseurs, as having brought the beautiful art of wood-engraving to great perfection. In his style, Dr. Anderson was abundantly copious, and sometimes, perhaps, inclined to the prolix; but, on perusing his longest works, it would be found difficult to omit any thing, without a visible injury to his train of reasoning, which was always perspicuous and guarded. In conversation, as well as in writing, he had the happy faculty of not only entering with spirit and zeal on anyfavourite subject, but of rendering it so intelligible, as to command attention in those to whom it might be of less importance, and convey instruction to those who sought it. His manners were gentleman-like, free, and unconstrained, and, in the social circle, had a dash of pleasantry, from the many anecdotes he had stored up in his travels and long experience; and with respect to the principal object of his attention, he had the happiness to see agriculture, in all its branches, become the favourite study of his country. The following is a correct list of his works: 1. “A practical treatise on Chimneys; containing full directions for constructing them in all cases, so as to draw well, and for removing smoke in houses,” London, 1776 12mo. 2. “Free Thoughts on the American Contest,” Edin. 1776, 8vo. 3. “Miscellaneous observations on planting and training Timber-trees, by Agricola,” Edinburgh, 1777, 8vo. 4. “Observations on the means of exciting a spirit of National Industry,” Edin. 1777, 4to. 5. “An enquiry into the nature of the Corn Laws, with a view to the new Corn Bill proposed for Scotland,” 1777, 8vo. 6. “Essays relating to Agriculture and rural affairs,” 1777, 8vo. 7. “An enquiry into the causes that have hitherto retarded the advancement of Agriculture in Europe; with hints for removing the circumstances that have chiefly obstructed its progress,” 1779, 4to. 8. “The interest of Great Britain, with regard to her American Colonies, considered,” 1782, 8vp. 9. “The true interest of Great Britain considered; or a proposal for establishing the | Northern British Fisheries,” 1783, 12mo. 10. “An account of the present state of the Hebrides and Western Coasts of Scotland; being the substance of a report to the Lords of the Treasury,” Edin. 1785, 8vo. 11. “Observations on Slavery; particularly with a view to its efforts on the British Colonies in the West Indies,” Manchester, 1789, 4to. 12. 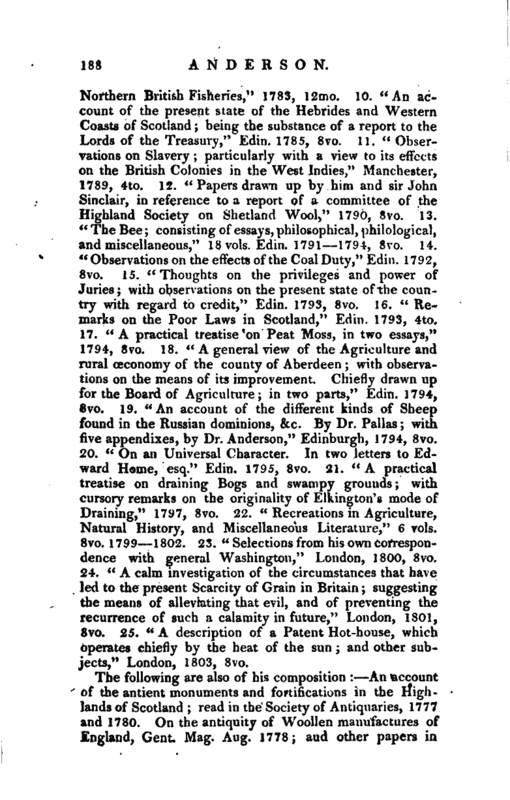 “Papers drawn up by him and sir John Sinclair, in reference to a report of a committee of the Highland Society on Shetland Wool,” 1790, 8vo. 13. “The Bee; consisting of essays, philosophical, philological, and miscellaneous,” 18vo ls. Edin. 1791—1794, 8vo. 14. “Observations on the effects of the Coal Duty,” Edin. 1792, 8vo. 15. “Thoughts on the privileges and power of Juries; with observations on the present state of the country with regard to credit,” Edin. 1793, 8vo. 16. “Remarks on the Poor Laws in Scotland,” Edin. 1793, 4to. 17. “A practical treatise on Peat Moss, in two essays,” 1794, 8vo. 18. “A general view of the Agriculture and rural œconomy of the county of Aberdeen; with observations on the means of its improvement. Chiefly drawn up for the Board of Agriculture; in two parts,” Edin. 1794, 8vo. 19. “An account of the different kinds of Sheep found in the Russian dominions, &c. By Dr. Pallas; with five appendixes, by Dr. Anderson,” Edinburgh, 1794, 8vo. 20. “On an Universal Character. In two letters to Edward Home, esq.” Edin. 1795, 8vo. 21. “A practical treatise on draining Bogs and swampy grounds; with cursory remarks on the originality of Ellungton’s mode of Draining,” 1797, 8vo. 22. “Recreations in Agriculture, Natural History, and Miscellaneous Literature,” 6 vols. 8vo. 1799—1802. 23. “Selections from his own correspondence with general Washington,” London, 1800, 8vo. 24. “A calm investigation of the circumstances that have led to the present Scarcity of Grain in Britain; suggesting the means of alleviating that evil, and of preventing the recurrence of such a calamity in future,” London, 1801, 8vo. 25. “A description of a Patent Hot-house, which operates chiefly by the heat of the sun; and other subjects,” London, 1803, 8vo. Gent. Mag. 1808, communicated by the family.